Review of Founders Curmudgeon Old Ale | Beer Apprentice - Craft Beer News, Reviews, Interviews and Info. For today’s craft beer review I’m going to be traveling back to Grand Rapids, Michigan (figuratively of course) and trying the Founders Curmudgeon Old Ale brewed by the Founders Brewing Company. As many of you know, I love what Founders produces, so I’m sure I may be a little biased when it comes to this brew. However, I will be objective, call it like I see it and give a fair review. 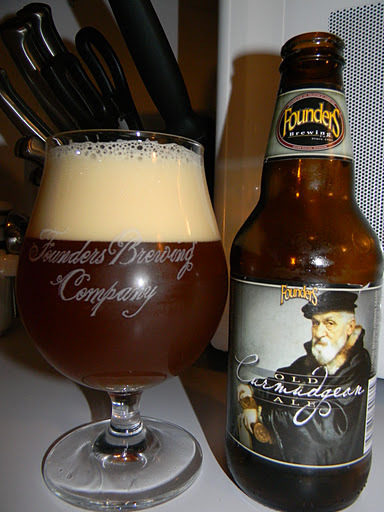 Let’s journey to the website, foundersbrewing.com, and see what kind of information we can find on the Curmudgeon Old Ale. This brew clocks in at 9.8% ABV and comes in a standard 12 oz. bottle. It poured a semi-hazy, lovely burgundy to almost “tea” brown color. From a very aggressive pour I received a very full and creamy off white head. It was wonderfully sized, had excellent retention and the lacing was very nice. The cap eventually settled to a fine ring around the top of the liquid. The nose brought forth some strikingly deep tones of sugared caramel and sweet toffee. Hints of molasses and dark, bready malts. Light touches of vanilla and oak along with a very minute distinction of hops. As the brew began to warm, the alcohol aspect became more noticeable. Nicely balanced and bold with the fragrance. The taste announced a rather rich, sweet and bold tone of sugary caramel and toffee. A significant jolt of alcohol was noticed, however it was melded so well that it never became distracting. More of that bready goodness was found and it tasted a lot like wheat bread. A slight recognition of hop tinges and bitterness tickled the sides of the tongue. As the brew warmed and started to open up the woody/oaky savors really began to become more prevalent and tasty. The malts really shine with the flavor of this beer. The mouthfeel was medium bodied. It was very smooth, chewy and dry with a negligible chalky quality. The brew started with a nice burn that gave way to a comfortable and mellow warmth as the palate adjusted. The roof of the mouth and tongue were left with a very nice dose of flavor after the swallow also. Well. Founders does it again. This is another great beer in my opinion. Lots of malty aroma and flavor that could satisfy most any craft beer enthusiast young or old. It’s relatively easy to drink considering he higher ABV and larger than normal malt profile, although I would still consider this a late night “sipper”. The Curmudgeon Old Ale is one of the better “Old Ales” on the market and I would highly recommend you guys giving it a try if you are able to do so. As always, thanks for reading and commenting. Remember to give me a holler on Twitter (@BeerApprentice and @shrews824) or Google+ (Scott Shrewsberry) if you would like to discuss all things craft beer.